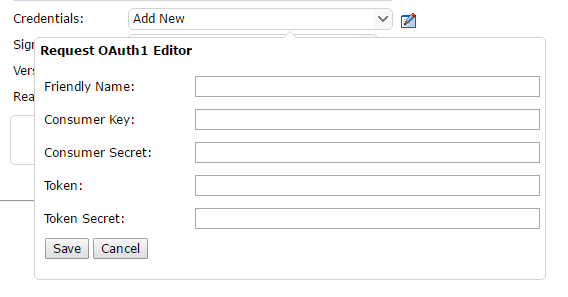 REST Client can be launched by clicking on the REST Client link from Editor. HTTP Method: Select a HTTP method from drop down. URL: Enter the REST API URL. 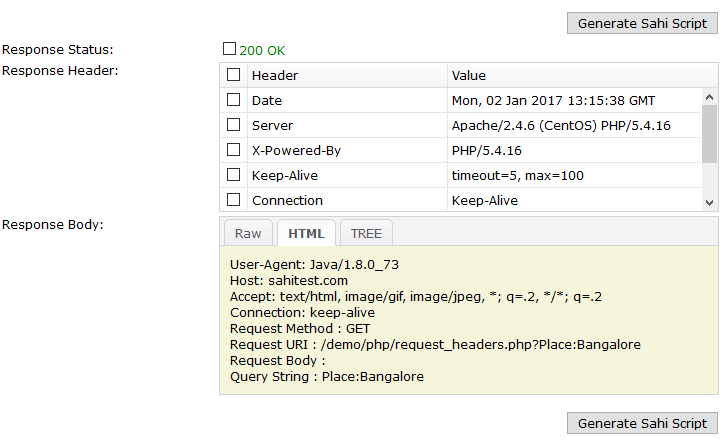 Parameters: Enter the parameters which will go as query string along with URL. Enter the required fields and click on 'Send Request' button to submit the request and get response. Click on Import request from HAR button. 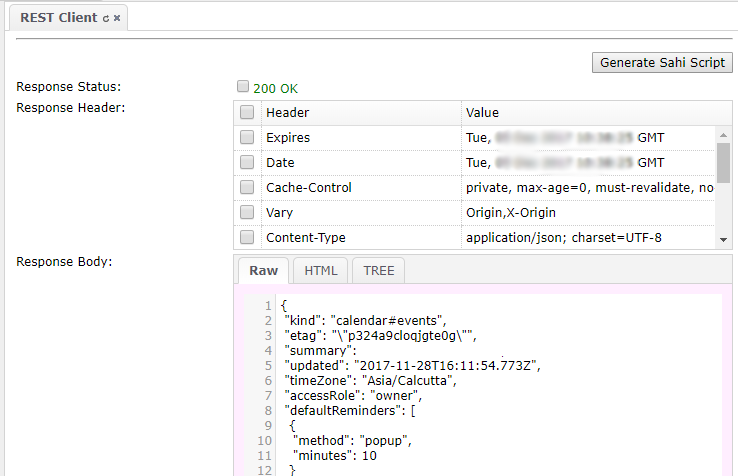 infoNote: Request section from HAR logs should be in JSON format. Check for opening and closing braces, else an alert would show up. 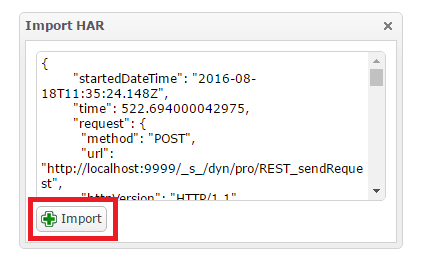 HAR logs can be accessed from developer's console > Network activity > Right click > save HAR. Response Status: Displays the response code returned by the server. Response Header: Displays the response headers returned by the server. Raw: Displays the response body as it is returned. HTML: Displays the parsed HTML if content type returned from server is HTML. 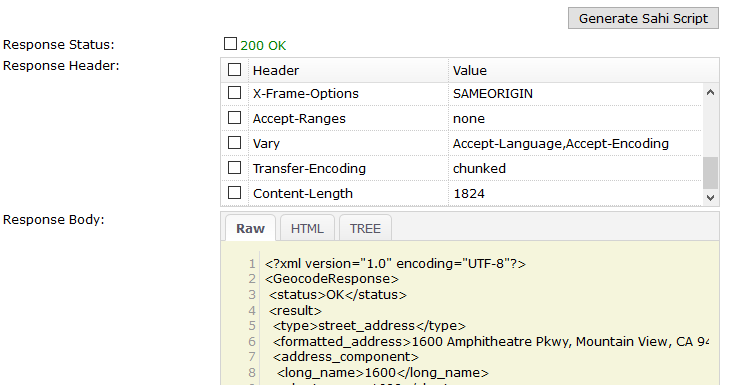 TREE: Displays the response body in tree structure if content type returned from server is JSON or XML. Select the parameters which has to be validated by selecting the checkboxes and click on Generate Sahi Script button. 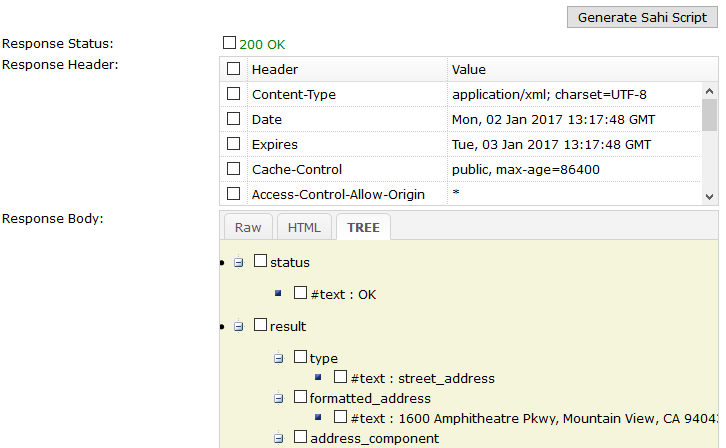 For example: select Response Status, Content Type from Request Headers and place_id from Reponse Body and click on Generate Sahi Script. Enter the username and password after selecting Basic Auth from dropdown. Choose OAuth 1.0 from the Authorization dropdown. Credentials: Select an already saved credential or select Add New from credentials dropdown to add a new credential. Enter a friendly name to save these credentials against. Enter the Consumer Key, Consumer Secret, Token, Token Secret. 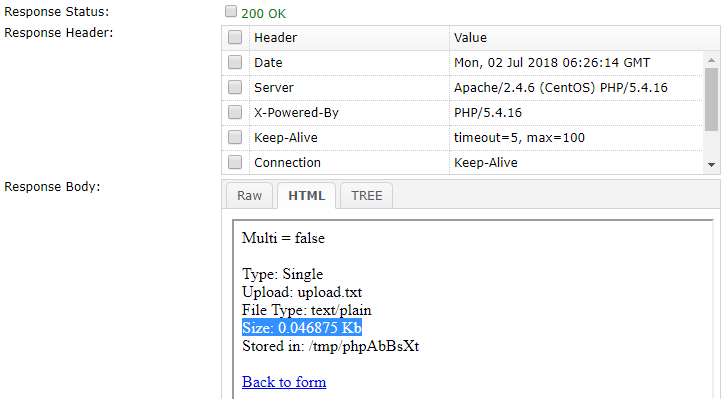 These details are provided by the API provider. 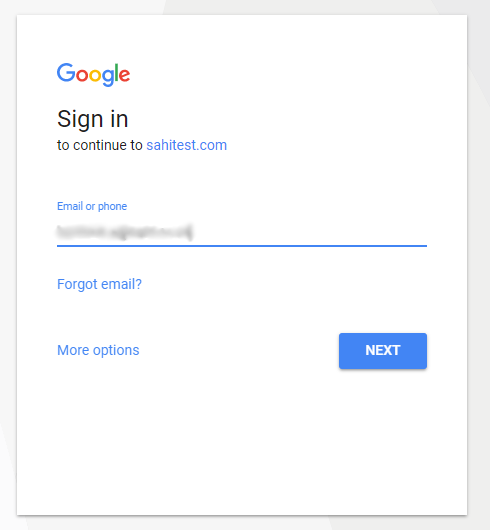 Signature Method: Sahi currently supports HMAC-SHA1 and HMAC-SHA256 signature methods. 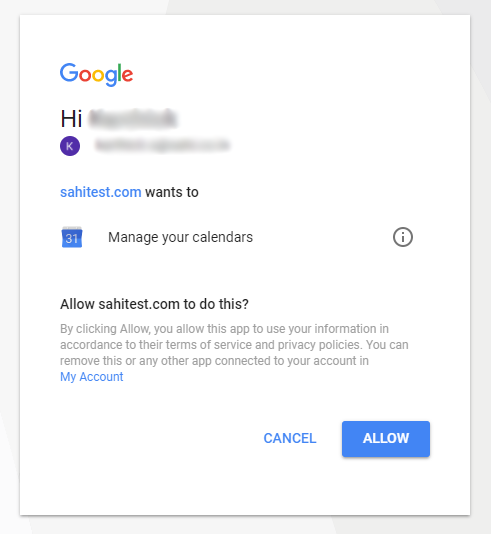 Version: Enter the version as required by the API under test. Realm: Enter the realm as required by the API under test. 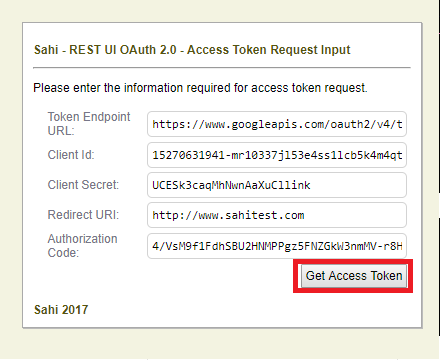 info We recommend you to read the article about OAuth 2 - OAuth 2 Simplified by Aaron Parecki if you're new to OAuth 2. 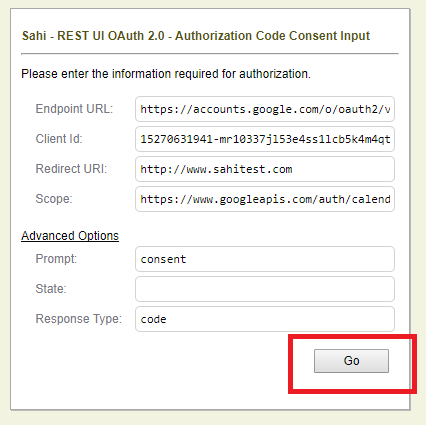 Sahi's OAuth 2 automation can be accessed from the Authorization drop down as shown in the picture below. This shows the Access Token field. Give the consent script a name. Once you click on Proceed, a new browser window will be opened and you will be prompted for authorization information.